The “natal”chart for the “British Independence” from the EU is really catastrophic for Britain and the EU and the date should by all means be set on a different date. The Saturn Pluto conjunction – constellation of foreign rule and influence and of being possessed – will be in a line with the Moon on the last degree of Capricorn conjunct the 27°Capricorn astrogeographic position of London and the South Node at 23°Capricorn. Actually the fact that the Moon position will be exactly conjunct London alone indicates that a change of date is improbable and things are on their way. I`m really shocked by the negativity of the astological constellations on that date. Venus the planet of wealth, income, rights, relationship and stability will be on the degree of depression, betrayal, bankrupcy, hidden manoeuvres, piracy and drowning at 3° Pisces the sign of instability, illusions, hidden reality and corruption. The Mercury-Neptune conjunction in Pisces too and in house 3 the house of communication is a constellation of lying and false flag propaganda, tax evasion, manipulation and false information. It absolutely stands for the lies, manipulation and foreign influence on which the alternative reality paradima, dishonesty and organized neofascist propaganda during the Brexit campaign had been built. These constellations clearly suggest that the Brexit is being stolen from the British people. In order for the Brexit to be able to open the way for a new start of the independence of the country from globalized capitalism and its currently most effectful strategy the globalized neofascist conspiracy and its terrorist agenda a date that holds constellations of independence, self-centeredeness and emancipation should be chosen for a positive outlook on the Brexit. Mars should be in house 1 or 2 for that – but in fact will be projected onto the descendant – the house of partners. That actually means that the brexit is organized as the image of an attack of europe ion poor Britain and not as Britain´s self-determined step out of dependence and foreign rule. Through that the momentum of initiative and responsibility is clearly transferred onto the EU. That makes the Brexit resemble an “inevitable” declaration of war on the economies of Britain`s European neighbour states. The whole date is a source of instability, suppressed confrontation, hidden manouvres, secret lobbyism and economical crisis. You can already see what`s ahead: Britain will be sucked out by global capitalist players – and voters under pressure from Mars on the degree of highest profits in Taurus. This position of Mars though it actually stands for highest profits – but due to the fact that Mars will not be on the side of Brtiain but on the side of its partners (descendant) the question here is: who will make these profits out of the Brexit? Not the people in Britain and anyway not the people in the EU – as the EU and the independence of the European countries will be severely weakened by the expectable constant aggression from global capitalist players on the weaknesses of the European self-help organization. The profiteers of the brexit are to be seen in the supercentralistic superpowers: US, Russia and China in the first place. And it is forseeable that Britain has been planned to become another Cayman Island state where the money from weapon deals, drugs, smuggling, corruption, tax evasion of all kinds, insolidarity and other attacks on the economies of the European neighbour states is supposed to pass through. For anybody really interested in astrology it should be made clear that the position of Mars falls right below the descendent – a constellation that rather resembles a declaration of war than the intention of constructive and peaceful cooperation. 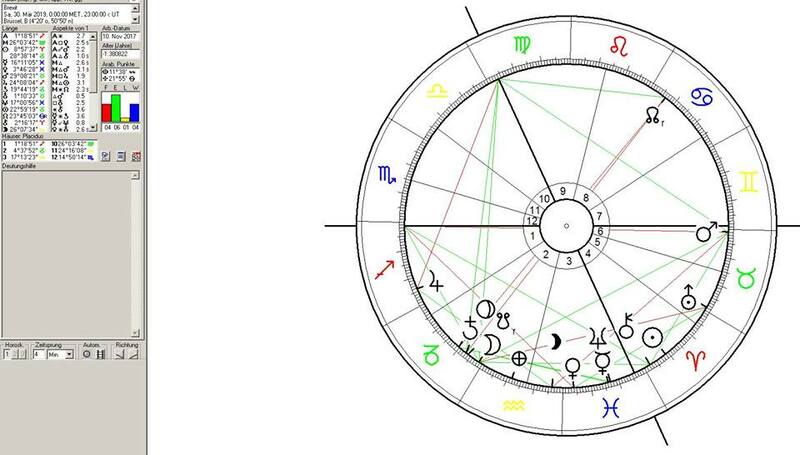 The astrological chart for British independence from the EU should have Mars the planet of new starts, independent action, personal strength and factual self-determination in the fields as the houses of self-responsibility and strength (houses 1,2,4,5) but not on the descendent – the realm of the others – or as in this case of the chosen enemy. What good could lie in the new start into the “Britain First independence” when the planet of initiatives (Mars) is transferred onto opponents instead of the realms of their country`s self-determination??? The fact that Venus the ruler of Taurus and thus of Mars`s position will be on the degree of corruption shows the heavy losses for the people in Britain and the EU that will be effected by the Brexit. The fact that Venus the planet that shows where the profits made from the extremely profitable position of Mars will go will be located in house 3 – shows that they will not remain in Britain but be transferred to other places. 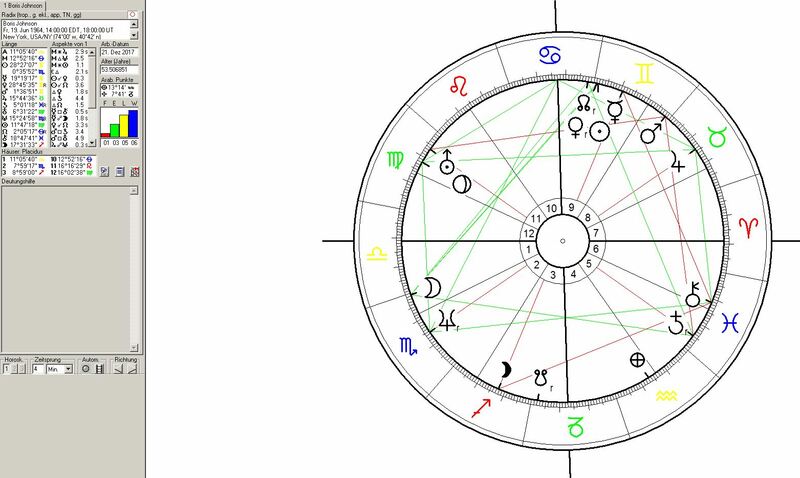 The combination of the Mercury-Neptune conjunction with the Venus position in Pisces are personified by Boris Johnson – the liar in chief for the US dominated Rupert Murdoch Media and the worldwide neofascist propaganda networks of the US Republican Party and their russian connection. Johnson was born with ascendant in Libra – which makes Venus the significator of his personality. His Sun -Mercury conjunction in Gemini the archetypal astrological sign of lying directly relates him to the topics and methods represented by the Mercury-Neptune conjunction of the Brexit chart. Johnson keeps repeating the lie that Britain is paying 400 million Euro to the EU each week when it was actually 170 million in 2016. This method of open lying is copied from Duginism / Trump-Bannon propaganda machinery. Donald Trump too was born with the Sun in Gemini.